When I was going through the Logs of the Commando I found an entry that I had written on May 3, 1960. It was for trip #6017 and it brought back a wave of memories, since that was my first encounter with the open waters of the Pacific Ocean. At the time I was being considered for a job with the Exploratory group which worked the outside waters from Mexico to the Bering Sea. The first thing that came to my mind was, would I become seasick once I was outside? If so, would three years of graduate school be wasted? There was no class about sea sickness given at the College of Fisheries, but there was talk. 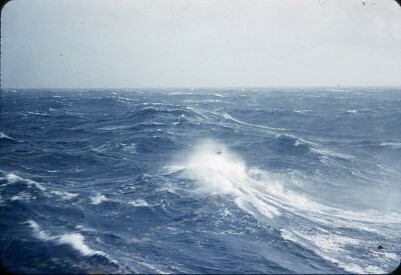 Seasickness is strange: some people get it and others don’t, and I felt that I wouldn’t because of the storm I went through on the Atlantic Ocean on my way back from France in 1956. I had completed my active duty with the US Army and was headed for discharge in Seattle on a 623’ troop transport, the USS General H. W. Butner, when she got caught in a hurricane. The seas were monstrous, the vessel was hove to and I, along with the rest of the troops, was locked below decks. 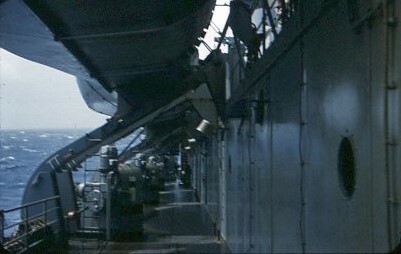 I remember lying in one of the stacks of bunks near the after part of the ship and as abnormal swells passed under us and the bow hung in the air, the whole ship would vibrate and you hoped the welds would hold. middle of a stairway in the bow that let out onto the foredeck, where it was my job to keep anyone from going on deck. At the bottom was a head full of vomit and some soldiers throwing up. As I sat on the stairs we would rise 20 to 30 feet as a swell approached and then drop the same distance as it passed underneath us before coming back up to repeat it again and again. Fortunately nobody came up the stairs. I was proud I never got sick, but I did feel a little woozy. After that experience I hoped I might be immune. 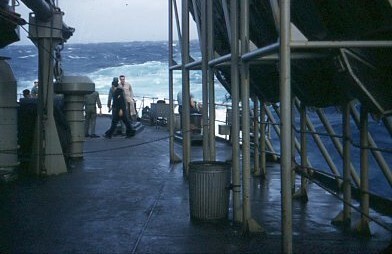 Once the hurricane had passed a few of us were allowed on deck. The swells were still large and the ship still headed into them. The sun was out, but there was a haze that was the remains of the storm. 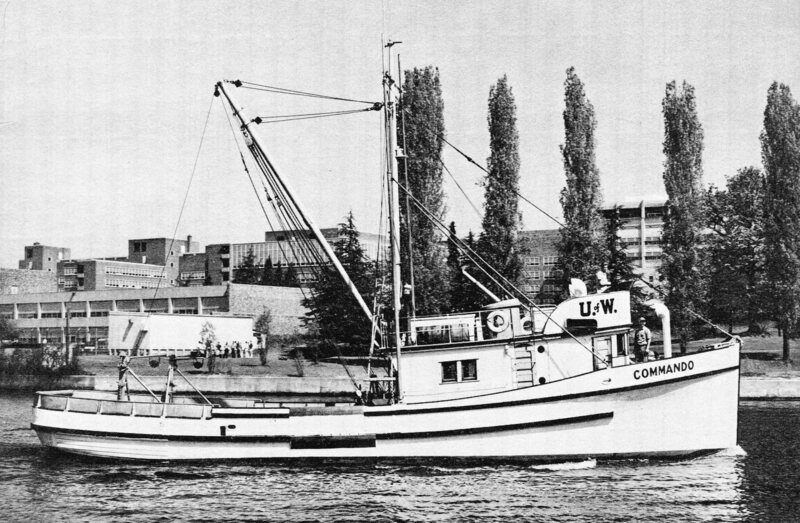 In 1960 I and two other graduate students had the opportunity to accompany the Commando for a week’s trip to the open ocean to collect Pacific or true cod Gadus microcephalus off the coast of Washington. We left the College on Monday morning May 2, 1960 and by dinnertime we were off Dungeness Spit and heading out the Straits of Juan DeFuca. A strong westerly wind was blowing directly down the straits with an ebbing, or outgoing tide against the wind, which made the waves even steeper as the vessel bucked into them. Since I was in the pilothouse when dinner was called, I went back to the galley and sat down, but after a bite or two of spaghetti I had to rush out the galley door to the deck – I was seasick. The motion of the Commando in that chop really got to me. On deck I threw up and leaned against the mast, but looking aft at the horizon from the center of the vessel I felt better so I went back to the pilothouse and remained there until I started feeling sick again. Went back to the mast, hoping that would help. As I looked around I saw that the deck was covered with vomited spaghetti – how could I have thrown up that much when I eaten so little? Dave, one of the other students, said that he had eaten a full dinner and then some, and he’d lost it all on deck. The third student gave us a bad time about seasickness, since he was feeling great and felt that the sea was his calling. We put into Neah Bay that night and proceeded offshore the next morning. The day was nice, with a slight breeze and a swell from the northwest and my seasickness was under control. So was Dave’s. But the third student was seasick off and on throughout the remaining days off the coast. As soon as we returned from the trip he changed his major to teaching and did a wonderful job as a science teacher on dry land once he graduated. We made four hauls the first day out, each about two hours long and in depths of 57 to 61 fathoms along the so-called bread line, as the fishermen call it, just south of Cape Flattery. After the fourth haul was up at 2000 or 8 PM, we secured everything and shut down for the night. We had taken 25 true cod in the first three sets and 70 in the last one. There were a few rockfish in the catch and I opened each to see the condition of their ovaries. Then everyone went to bed, I in the upper bunk on the starboard side of the house. the water as the gentle swells lifted and lowered the vessel. I kept wondering where we were drifting, as we could see light on the beach before we went to bed. Tom and the others were sleeping soundly. Morning came and everyone got up and went into the galley, where we waited for the coffee to perk. Looking out the door, it seemed to me as though we hadn’t drifted during the night and I mentioned that “We didn’t move much last night.” No one said a word. The coffee perked and as they were drinking it, I looked out again and said “That spot on shore is in the same place as it was last night, so why didn’t we drift? We should have.” No one said a word. When Tom and Olaf had finished their coffee, Tom told Olaf “Start up the engine and then haul the anchor” and that’s when I realized that we had anchored all night in the open ocean. If I had known that I would have slept better. Talk about a greenhorn……. Outriggers are common on these vessels, especially the smaller ones. 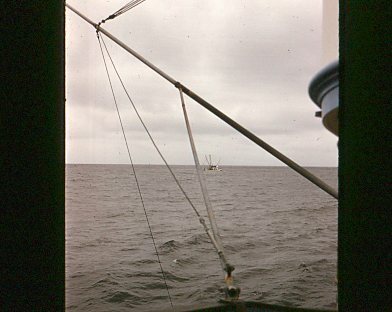 There are two poles that are spread out from the mast at about 45 degrees from the vessel, like trolling poles on the salmon trollers. They are stayed rigidly in a fixed location and from each pole there is a cable with a bird attached to it. The bird is a weighted cylinder with a triangle fin on each side like wings of a delta jet, and a vertical tail. When the vessel rolls in a swell, the device slows the roll as it is pulled up through the water on one side with the flat part of the wings resisting the water, while on the other side it sinks head first with the leading edge of the wings cutting through the water with no resistance. Once the vessel completes the roll and starts the other way, the stabilizer reverses and slows down the rolling. 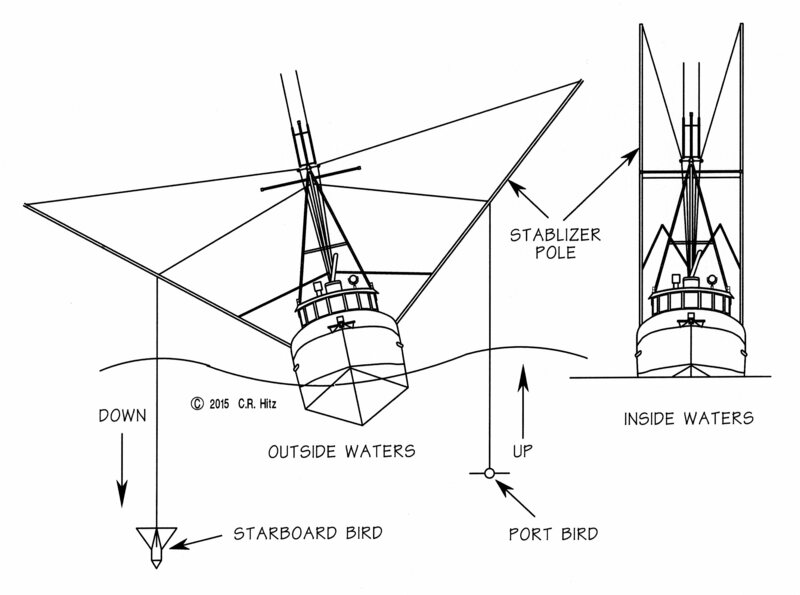 The upper part of the tail helps keep the bird in line when the vessel is underway. The devices are always deployed when the vessel goes into the open ocean, as was done on the Commando when she left Neah Bay for the outside waters. After the anchor was pulled, we proceeded offshore and made our first set at 0450 in the morning in about 58-60 fathoms for a two-hour tow south near Destruction Island. We took 40 true cod in that haul and then made a second haul in about the same location at 0722, which lasted another two hours and we took another 40 true cod. Again there were a few rockfish in the catch which I measured and sexed, along with a few flatfish and small halibut. 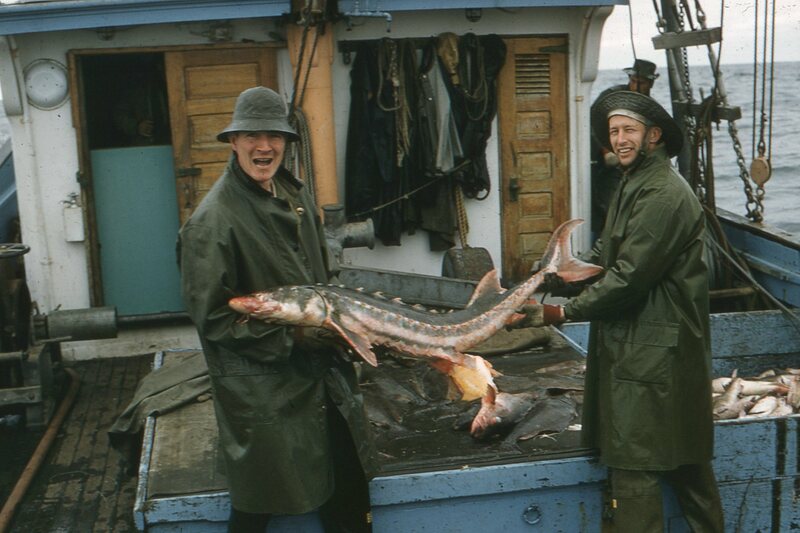 There was a surprise in the catch, a white sturgeon Acipenser transmontanus. We all took part of it home as home pack and it was delicious. 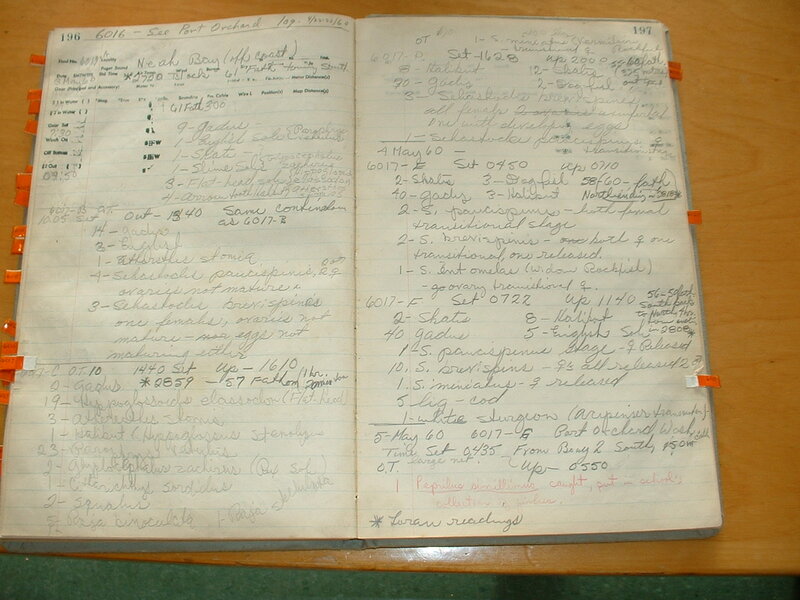 On the way back, we made the last haul in Puget Sound at Port Orchard at 0435 the next morning, May 5, 1960, the last haul made in my study. It is recorded in the Commando fish log as haul 6017-G, the seventh tow for the trip. I had survived the coastal trip and felt seasickness was part of the job, and looked forward to joining the Exploratory group and going to sea on the John N. Cobb. This entry was posted in Environmental History, Exploratory Fishing Base, fisheries science, Fishing, History of Science, History of Technology, Maritime History, Ocean fishing, Pacific Fishing History Project, R/V John N. Cobb, Sebastes rockfish, World History and tagged Bob Hitz, Fisheries Science, groundfish, Pacific Fishery History Project, Sebastes rockfish, trawling, USS General H. W. Butner. Bookmark the permalink.